All signs continue to point to the invasion of a brutally cold air mass into the north-central US next week that will make its way to the east coast around mid-week. As the Arctic air pushes towards the eastern seaboard, low pressure may form along the strong cold frontal boundary zone possibly resulting in some snowfall late Tuesday or Tuesday night in the Mid-Atlantic region. This upcoming Arctic air outbreak looks quite similar to the bitter cold air mass that impacted the central and eastern US during January 1985 which followed a major stratospheric warming event - much like what we have just experienced over the past several weeks. This kind of air mass is likely to become a news making event for the Upper Midwest/Great Lakes and could result in actual air temperatures as severe as 25 degrees below zero or so in Chicago, Illinois – awfully close to their all-time record low of -27°F set in January 1985. The Great Lakes ice cover doubled in the past week and will increase dramatically over the next week. Today’s chill in the eastern US is quite a contrast from yesterday’s unseasonably mild weather, but it may pale in comparison to what is coming around the middle of next week. Indeed, the next couple of days will be colder-than-normal in the Mid-Atlantic region despite some sunshine each day and temperatures will actually take a step down on Saturday following the passage of a secondary cold front. 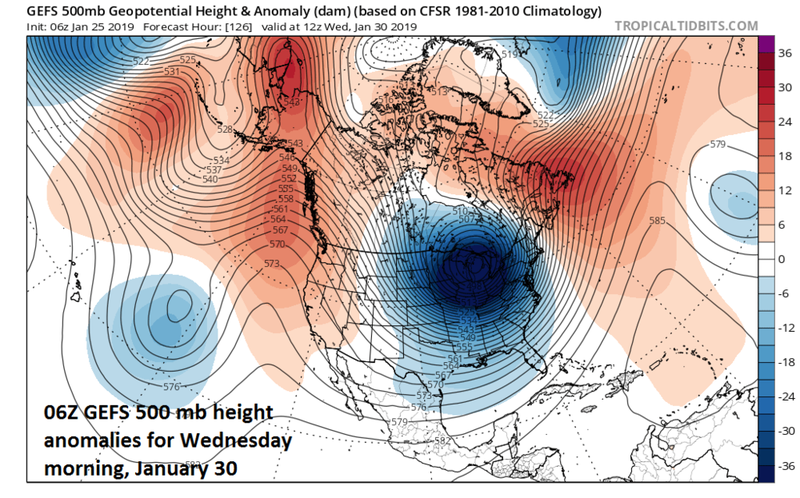 An even colder air mass is in the offing for the middle and latter parts of next week. By Monday of next week, low pressure will likely be located over the Upper Midwest and it may spread some accumulating snow across the Great Lakes region and at the same time strong high pressure will be dropping southward through Canada towards the south-central part of that nation. On Tuesday, this low pressure will shift to a position over the eastern Great Lakes and a strong north-to-south cold front will trail it on its south side. Brutal cold air will push into the Northern Plains by Tuesday and the winds will be quite strong as well producing dangerously cold wind chill values. This frontal boundary zone may then become the breeding ground for low pressure as the cold air outbreak first arrives in the eastern states – potentially resulting in some snowfall in the Mid-Atlantic region. Once that front clears the east coast, the gates will be opened up for the arrival of brutally cold air likely resulting in bitter cold days on Wednesday and Thursday in the Mid-Atlantic/Northeast US. The biggest impact by this upcoming intense cold air outbreak will be in the Upper Midwest/Great Lakes where a deep upper-level low will position itself for a couple of days. Chicago, for example, could wake up on Wednesday morning with temperatures some 25 degrees below zero – rivaling the all-time low temperatures record set there in January 1985 of -27°F. The ice cover on the Great Lakes will increase dramatically over the next week or so and actually doubled over the past week now totaling around 25%. We have just gone through a several week period with a major stratospheric warming event which has disrupted the normal magnitude and positioning of the polar vortex. As a result, intense cold air masses have a greater chance of impacting the middle latitudes including across the central and eastern US. In fact, a similar major stratospheric warming event took place in December 1984 and intense cold followed for the central and eastern US in late January of 1985 – some several weeks after the initial warming in the polar stratosphere. In fact, it turned out to be so cold for Ronald Reagan’s second inauguration on January 20th, 1985 that all outdoor activities planned for that day in Washington, D.,C. were moved inside to protect the public. 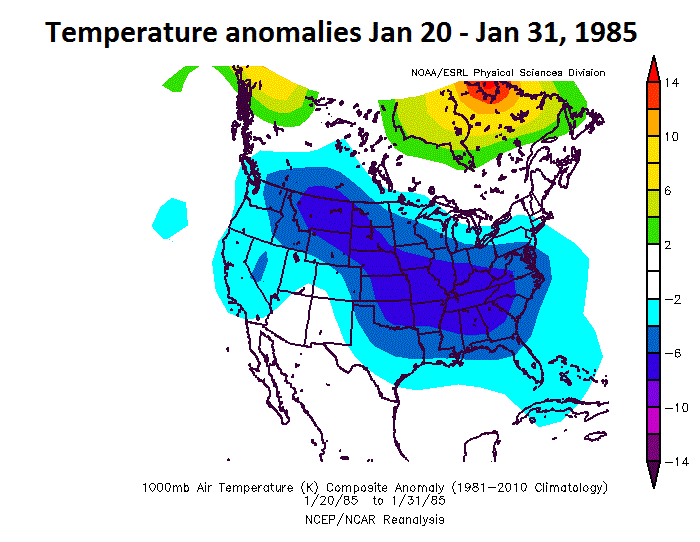 Interestingly, the month of December in 1984 actually was warmer-than-normal in much of the eastern half of the nation – similar to this winter. The all-time low temperature record for Chicago of -27°F was set on January 20, 1985 during this Arctic outbreak of extreme cold and it may be in jeopardy next week. One final note, there is some good news in the sense that it almost has to get warmer following this cold air outbreak since this is likely to be the coldest air mass in North America all of next week - and, yes, spring training is only about 17 days away.